Fat Bruce Lee and I chose Burger and Barrel as the place to acquire some additional arterial plaque while in NYC. Burger and Barrel opened recently and was the sister restaurant of Lure Fish Bar, where I had been the previous evening with Strawberry Shortcake. The burger at Lure was pretty unimpressive, but the burger cooking A-Team, Chef Josh Capon, had moved over to Burger and Barrel to create awesomeness with ground beef, so we had high hopes. As luck would have it, Chef Capon was in the kitchen that day when we were there for lunch. The Beef: According to the wait staff, it was the same 75:25 meat to fat, chuck heavy blend of chuck, brisket, and boneless short rib. This was same beef that they served at Lure Fish Bar. It too was packed medium firm with a nice, coarse, hearty grind. It had a nice front note of funk, and while it was as lip-dabbingly oily as its counterpart, it was far juicier. Additionally, this beef did taste a little better--it was funky but more flavorful with some iron notes from the blood--those iron notes were entirely lacking at Lure Fish Bar the previous evening. The Seasoning: This burger's exterior was well and properly seasoned on the outside and left alone on the inside. It could have used a little seasoning on the interior, but the blood and powerful funk partially made up for that. The Sear: It was actually far weaker than we got at the sister restaurant. This was especially off-putting upon noting that they had a broiler available. You will note from the photos that they got a better sear on the cheese than the meat. Seared cheese--I didn't need that--yech. I guess Chef Capon had better things to do than oversee and adjust the quality that the kitchen was sending out. Moments after our food came out, he parked himself at a table of familiars. Perhaps he put his time and attention into their food. The Preparation: Probably griddled, since there wasn't a trace of a grill mark. They got our burgers to Medium, which is how we ordered them. Cheese: American, and it was lost on this burger--the funk and the fat rendered the cheese irrelevant. Additionally, the cheese was scorched, so it lost its creaminess and flavor. The Bun: The bun was a weakly toasted, neutral brioche. This bun was far superior to the sweet, oily bun served at the sister restaurant. This bun, based on its relative lack of elasticity, appeared to be light on the egg that was present in the Lure Fishbar bun, which was a plus. 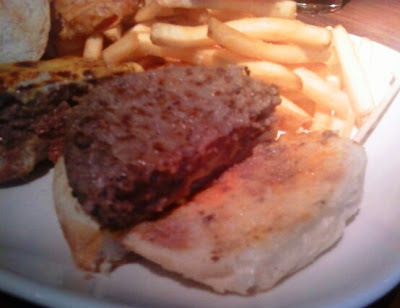 The Meat to Bun Ratio: It was fine--this bun compressed properly and yielded when requested. The Fries: These were crisp and cooked in peanut oil. They tasted fresh and were seasoned properly--they were pretty great. Oh, the onion rings were good, too--crispy and sweet. The Value: It was a better-than-average burger. $13 in NYC for a decent burger is almost downright reasonable. Considering the hype on the majority of the food review sites, I had hoped for more. 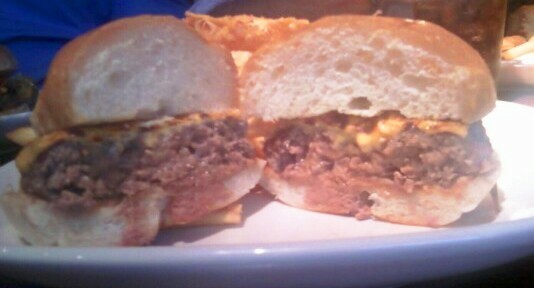 In spite of a weak sear, scorched cheese, and a half-assedly toasted bun, the quality of the beef and seasonings made the cheeseburger at Burger and Barrel 25% better than the identical fare at Lure Fish Bar. 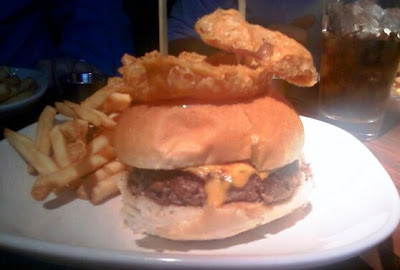 Burger Review : Burger and Barrel did not live up to the hype, but it deliver a pretty good burger. If you are in the market for "pretty good," then Burger and Barrel is an option. 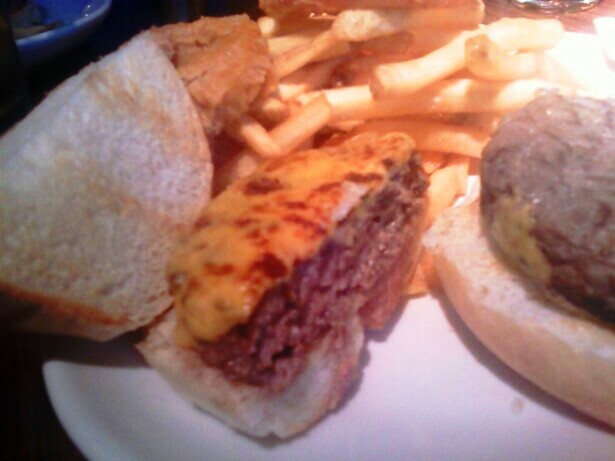 If the chef had been on the ball in the kitchen, this could have been a much better cheeseburger....sigh.